If only there was some way to get people to limit their usage by showing them how much they are using. Say by charging them, using, perhaps, prices? 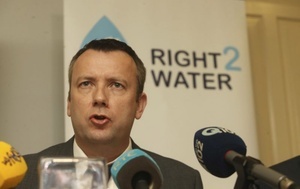 So when Ronan Lyons, a senior economist says that water charges would have prevented water shortages, one would question whether this erroneous statement is through ignorance, or through assumed knowledge. 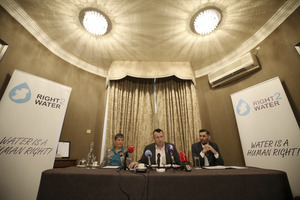 When people with actual expertise in this matter came to Ireland to talk about our water crisis, they were completely ignored. Not one media outlet interviewed Maude Barlow or covered the two speeches she made. Maude, if you don’t know, has written four books on water and was an advisor to the UN on water, along with dozens of other accolades. She is widely recognised as one of he worlds leading experts on water. Her statement simply didn’t fit the medias and right-wing agenda. 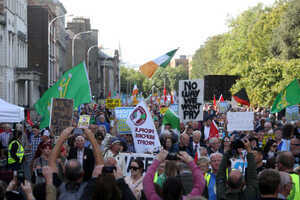 When the European Water Movement, the activists who are battling against water shut-offs and water poverty all across Europe released their statement on the water privatisation agenda in Ireland, they were also completely ignored. “It is clear that the best method of securing access to water, and securing funds for infrastructural investment, is through general taxation. 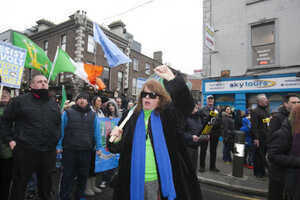 When Wenonah Hauter, Executive Director for Food and Water watch provided the Irish media with some relevant and valuable information about water, again, ignored. Remember, Wenonah is based in a country where up to 70,000 families had their water shut off in one city alone, Detroit. “This market-oriented pricing reform is fundamentally flawed. It assumes that households can or will reduce water use when faced with metering and higher prices. However, residential water use is a small fraction of water withdrawals and even draconian water price increases will have little impact on household water consumption. For most households, water goes towards essential uses like drinking, cooking and sanitation; consumer demand for water does not really change, regardless of price. Maybe we don’t get balanced coverage because the Irish media, who are currently struggling to make a profit, with many relying on paid advertorials from the government, were also receiving up to €3 million per year in advertising revenue from Irish Water? 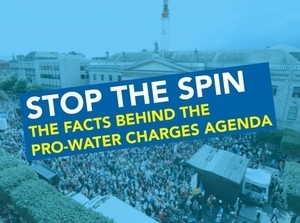 Even when the government’s own “expert commission on water” published the facts and figures behind our water usage – supporting what Right2Water Ireland has been saying for years – the line from the media was that we need water charges. The question everyone should be asking is, which is the optimum method of paying for water from an environmental, economic and social perspective. 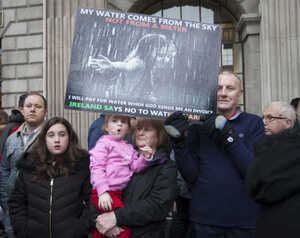 With abstraction charges, effective commercial water charges and government subvention, Ireland can ensure we never have water poverty while at the same time providing the badly needed investment in our water infrastructure. Don’t let ill informed ‘know-it-all’ economists or the media spin their ignorance or their propagenda in pursuit of a neo-liberal policy of water commodification and financialisation. They did it in housing, health, education and other sectors of our society with devastating impacts, let’s keep our water out of their ideology and their ideology out of our water, and let’s not make the mistakes that the rest of the world has already made – and is paying for now. 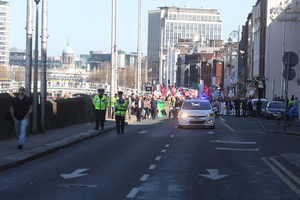 Oh, and if you protested against the introduction of water charges, you are a hero, and you should be proud. Do not let them blame you for water shortages, that responsibility is entirely down to those who refuse to tackle the real wasters (commercial enterprises) and those who cut funding for water infrastructure (Fianna Fail, Fine Gael, Labour and the Green Party). Now, can we please stop the waste of money on meters, advertising, call centres, consultants, etc, and use the savings to fix the damn pipes? 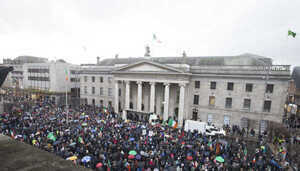 And finally, sign the petition and call on your local TD’s to support a referendum on water ownership. Posted in Misc and tagged Irish Water, Privatisation, Right2Water at 4:17 pm on March 14, 2018 by Bodger. 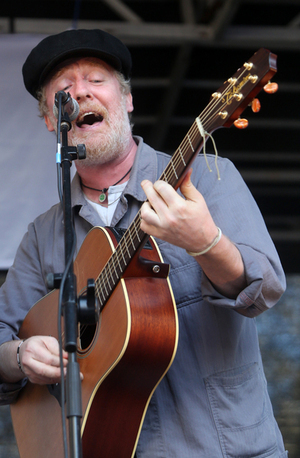 Thousands take to the streets for the latest Right2Water protest which included a rally in College Green featuring leading anti-water charge activists Brendan Ogle, Mary Lou McDonald TD, Paul Murphy TD and Joan Collins TD plus a performance by musician Glenn Hansard. 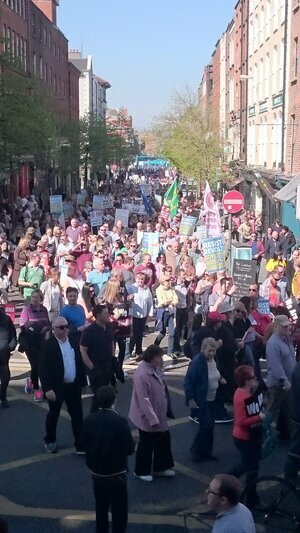 Posted in Misc and tagged Irish Water, Right2Water at 5:57 pm on April 8, 2017 by Admin. I am guessing we won’t see many of your commenters tomorrow but all who see this rightly as a victory for the people are most welcome…. 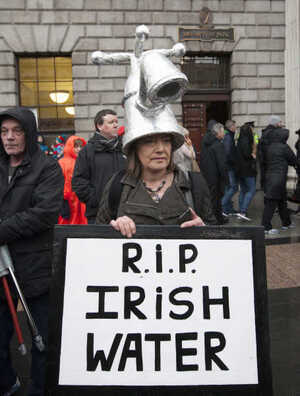 Posted in Misc and tagged Irish Water, Right2Water at 3:47 pm on April 7, 2017 by Broadsheet. 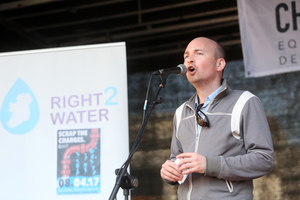 Right2Water activists, including Brendan Ogle and Paul Murphy, welcomed the “now inevitable” ending of domestic water charges and blanket metering programme, the “consensus that there must be a referendum on protecting the ownership of the public water system in the Constitution” and called on all charges against water protesters to be dropped. 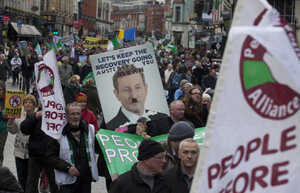 “This is our win, it is a win for a peoples’ movement all over Ireland, but while it is a massive win it is also a partial win. We want all single meters gone. 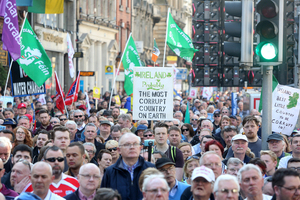 Details of the planned Right2Water demonstration in Dublin next Saturday were also confirmed. 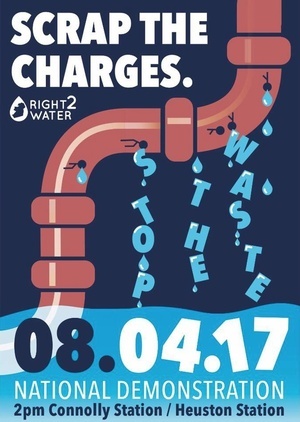 Posted in Misc and tagged Irish Water, Right2Water at 12:39 pm on April 4, 2017 by Broadsheet. 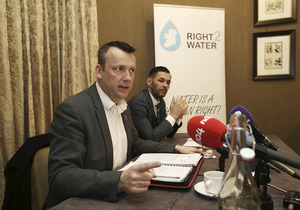 Right2Water’s Brendan Ogle and Sinn Féin’s Jonathan O Brien TD announce plans to have what they have entitled ‘ the Last Push ‘ demonstration on April 8 in Dublin city. 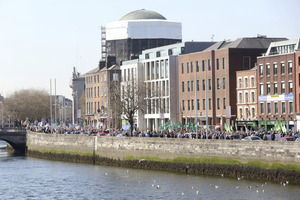 “The demonstration on April 8th will allow the public to demonstrate that this issue is not an issue of political opportunism but is, and always has been, about vindication of our human Right2Water by paying for our water and sanitation through the exemplary model of progressive taxation. 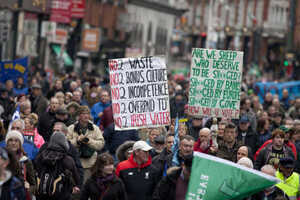 Posted in Misc and tagged Irish Water, Right2Water at 4:06 pm on March 9, 2017 by Broadsheet. At a meeting of the Joint Committee on the Future Funding of Domestic Water Services. 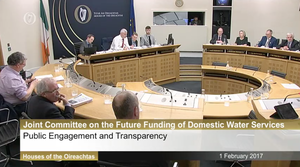 The committee discussed the matter of ‘public engagement and transparency’ with officials from the Commission for Energy Regulation, Irish Water, and the Public Water Forum. 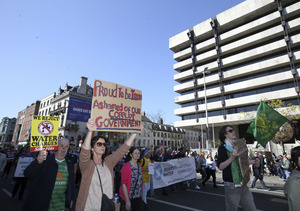 It also held a vote on whether to hear from representatives of the Right2Water group. 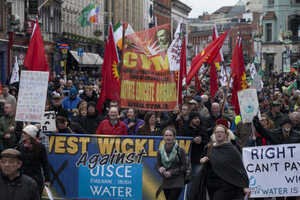 It’s being reported that Fine Gael lost the vote 6-12 with the committee’s other members grouping together to ensure Right2Water representatives could speak next Tuesday. The six Fine Gael TDs on the committee are: TDs Colm Brophy, Jim Daly, Alan Farrell, Martin Heydon, Kate O’Connell and Senator Paudie Coffey. 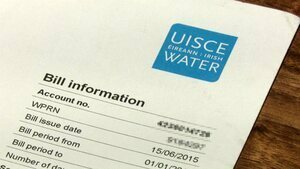 Posted in Misc and tagged Irish Water, joint committee, Right2Water, water services at 5:00 pm on February 1, 2017 by Broadsheet. 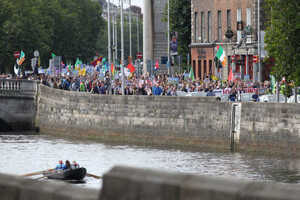 The Right2Water rally against water charges. 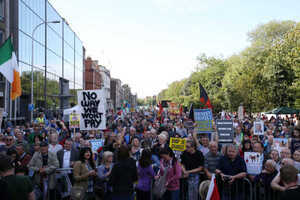 Yesterday: Paul Murphy TD: Will You Get Behind Us? 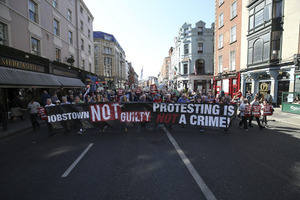 Posted in Misc and tagged Right2Water at 4:23 pm on September 17, 2016 by Broadsheet. 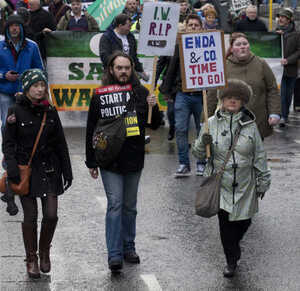 But will the 32nd Dáil subvert its democratic mandate to keep Irish Water running? 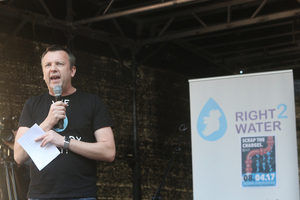 When Right2Water exploded onto our streets on 11 October, 2014 as the umbrella campaign for the anti-water charges movement a promise was made. 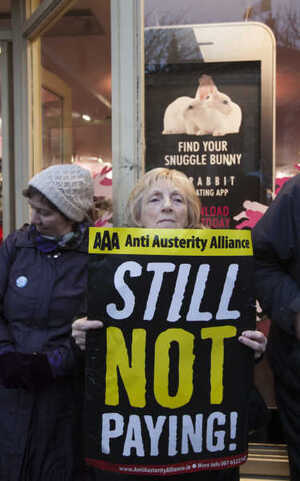 Unusually in Irish public life this promise was kept. 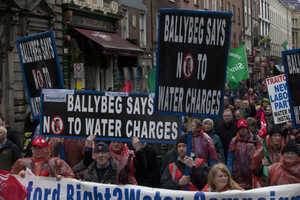 The promise was that Right2Water would be around AT LEAST until the next election seeking the abolition of the regressive double water tax. We also promised that this would be the number one issue in the next election. For a year and a half commentators and establishment politicians sneered at these claims and repeatedly told us that the campaign had dissipated. After election 2016 nobody is sneering. What seemed unlikely, or even impossible, has happened. 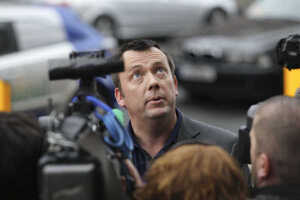 Labour have been humiliated by their traditional voters and Alan Kelly has been humiliated by what remains of Labour. Fine Gael have lost one third of their seats and the two large right wing ‘Irish Tory’ parties, Fine Gael and Fianna Fail, can’t even claim that they command the support of a majority in this divided state combined. Seismic change. 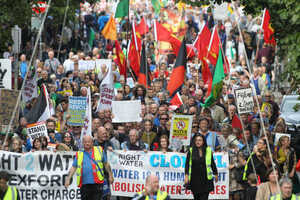 Irish Water has been rejected in the polls and, politically and financially, is a beaten docket with charges now suspended. 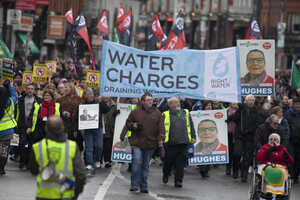 Irish Water, and the privatisation agenda that it represents, has been beaten up, but it is not yet beaten. 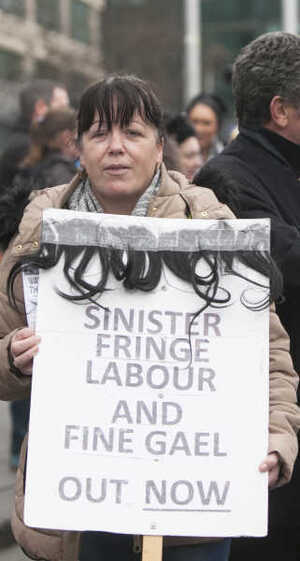 Last week Fianna Fail failed to deliver on its electoral commitment to abolish the super quango when given the opportunity in a Dail vote. Fianna Fail joined a long list of 59 TDs who either abstained on this vote or were unavailable. 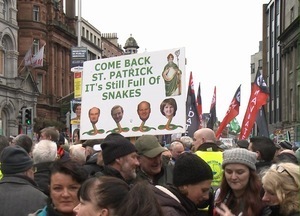 Even worse, however, is that the vote was carried by 60 TDs vs. 39 TDs and the 60 even included John Halligan and Finian McGrath as Independents. 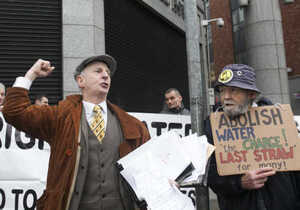 So, for now, Irish Water continues to function on life support. It’s time to pull the plug. 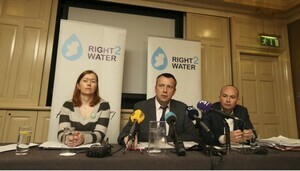 The day before this vote I attended a very positive meeting of the three Right2Water pillars. 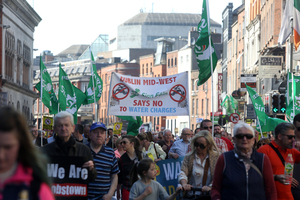 This involves trade unions, political parties and independents, and also community activists, working together to seek abolition of Irish Water. These three strands worked together since 2014 and delivered the largest (per capita) and most peaceful protest movement anywhere in the world today. Our objectives are simple. 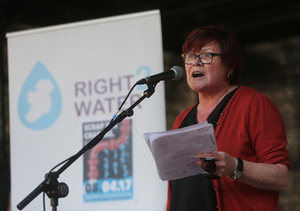 We want Irish Water abolished and replaced with a single national water and sanitation board funded through progressive general taxation. This will require a referendum and in the coming weeks a Bill sponsored by Joan Collins TD and signed by Sinn Féin, PBP, AAA and other Independents goes before the Dail proposing exactly that. 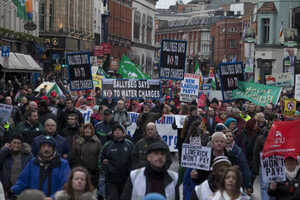 Since the beginning public debate of the Irish Water issue has been conducted as if a fiction were true. 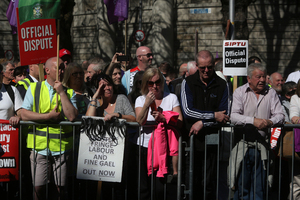 That fiction is that Irish Water, the meters and the billing system is not about privatisation. 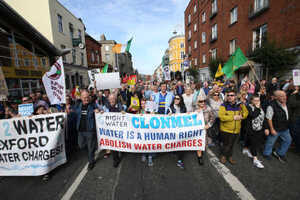 All across the globe vulture funds and corporates are taking ownership of public water supplies and turning our human Right2Water into a right to profit for the 1%. They are turning that which we need to live into a commodity that they can turn off and deny to citizens at will. Apart from ‘financial services’ nothing delivers bigger profit margins for these vultures than our life sustaining water. From Bolivia to Berlin, and from Portugal to Portroe corporate interests have ensnared politicians to do their bidding and hand the people’s water over to them. But the people have fought back and prevented this happening or even won water back through re-municipalisation as has happened in Bolivia, Berlin and Paris for example. 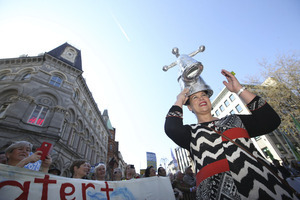 Water in Paris and Belin were both re-municipalised in 2014 following rising bills, lack of investment in new infrastructure and public pressure. The Cochabamba water war took place in Bolivia’s third largest city in 1999 and 2000. A community coalition ‘Coordinadora in Defence of Water and Life’ won after public protests which saw one protestor killed. The privatisation was reversed. 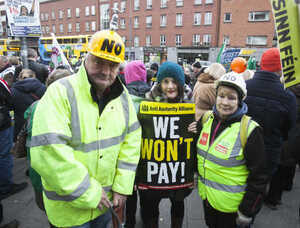 Of course, on the rare occasion that the media have put this to them, politicians in Fine Gael, Labour and the Greens have rejected the argument that they are engaging in a privatisation quest. And they have been allowed to issue bland denials of what is blindingly obvious without being held accountable. That is now about to end. 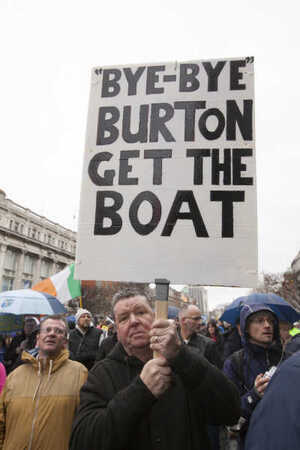 If privatisation is not the agenda behind Irish Water then this ‘Government’ can save itself no end of trouble by simply supporting Joan Collins’ bill when it goes before the Dail. 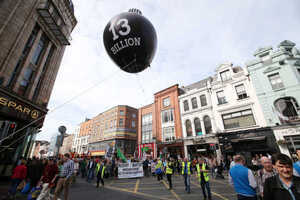 I personally believe that the expected failure of Fine Gael to support this bill, or further obfuscation by Fianna Fail or Shane Ross’s ‘Independents’ that prevents this vital bill from being passed, will be a subversion of the democratic mandate of the 32nd Dail that will require a response. This Government is barely a Government at all and it is already hanging by a thread before it has even begun. 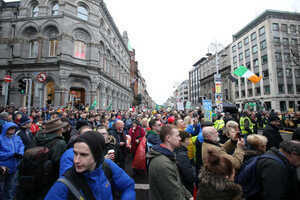 People power led to a massive change in the electoral shape of Ireland in the February election. I don’t believe for one minute that the necessary change is complete. In fact I believe it has only just begun. Posted in Misc and tagged Brendan Ogle, Irish Water, Right2Water at 8:52 am on May 31, 2016 by Admin. 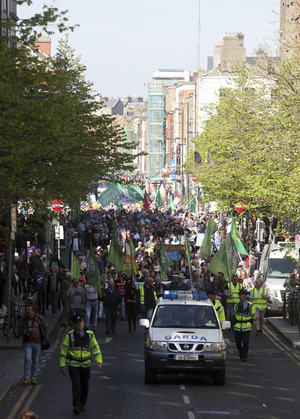 Scenes from the Right2Water march in Dublin City Centre. 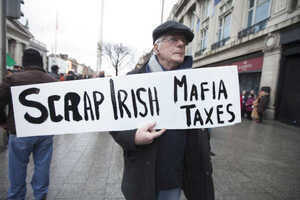 Posted in Misc and tagged Irish Water, Right2Water at 5:34 pm on February 20, 2016 by Broadsheet. 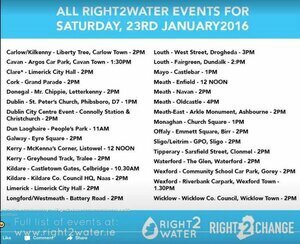 Itemised series of Right2Water events across the country. 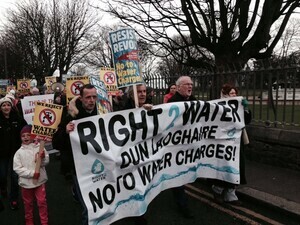 The Right2Water march in Dun Laoghaire, Co Dublin underway at 11a,. 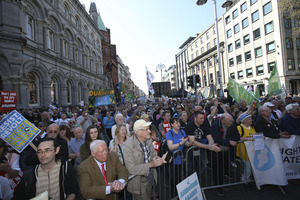 Right2Water protesters in Dublin city centre. 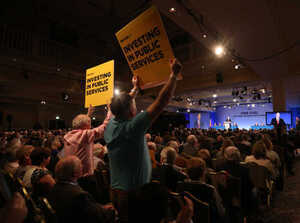 Fine Gael Ard Fheis tonight at Citywest during Enda Kenny’s keynote address. 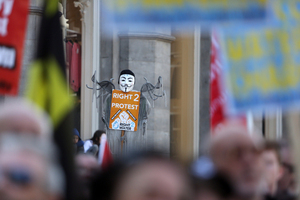 Posted in Misc and tagged Right2Water at 12:33 pm on January 23, 2016 by Broadsheet.